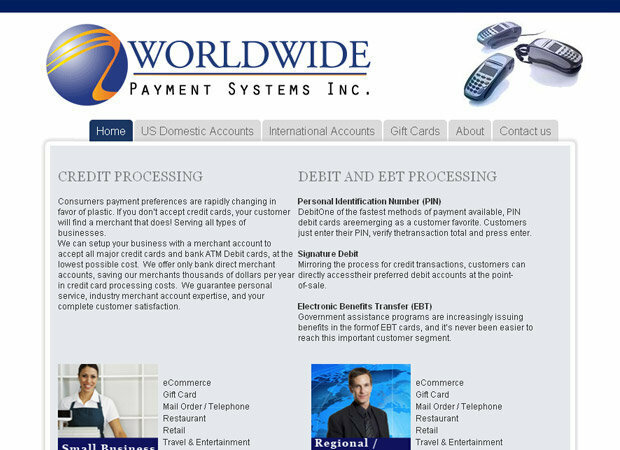 World Wide Payment System is a merchant account provider located in South Florida with a very high reputation for their services and support. They provide any kind of business with all the necessary hardware and online payment gateway need to start accepting credit cards and checks right away. We created a very sophisticated and search engine friendly oriented web design to allow them archive the fresh and professional look their company have. The website also include a back-end administration to easily manage and control the website design, menu and pages, form-to-email functionalities, image management and WYSIWYG online editor are part of the online application created specifically for them.